How does food insecurity affect our health? According to San Diego State University nutrition professor Amanda McClain, the consequences of food insecurity aren’t limited to hunger. People who don’t know where their next meal will come from experience high levels of stress and uncertainty, which can negatively impact their physical and mental health. McClain’s research considers ways to reduce food insecurity. She has found that by participating in food assistance and community service programs, the food insecure can reduce stress and improve their health. Learn more about Dr. McClain's work. Professor Nick Barber is working to save one of the most endangered ecosystems on the planet: America’s tallgrass prairie. Ninety-five percent of tallgrass prairie has been eliminated in the conversion to crops and cities. In research supported by the National Science Foundation (NSF), Barber studies how to restore the prairie and support the biodiversity of the plants, animals, and microorganisms that live there. One of Barber’s favorite things about his research is working in tandem with students. Follow Dr. Barber on Twitter. The SDSU Heart Institute receives funding from the National Institutes of Health to research a possible drug treatment for heart attacks. Molecular cardiologist Chris Glembotski is hoping his research will lead to clinical trials and result in a drug therapy that patients receive immediately after a heart attack. Learn more about Dr. Glembotzki's work. San Diego State University biology professor Luke MIller conducts research in Alaska working with scientists from University of California’s Irvine and Santa Cruz campuses to study how climate change affects tide pools and the organisms that live in them. Their work is funded by the National Science Foundation. Follow Dr. Miller's work on Twitter. KQED features the research of SDSU professor Marshal Hedin and University of California, Davis, researcher James Starrett. The duo works to better understand how the changing environment might have shaped how turret spiders evolved in California. How can we create healthy environments for families that have experienced domestic violence? San Diego State University social work professor Ijeoma Nwabuzor Ogbonnaya studies difficult issues like domestic violence and child maltreatment. She researches, designs and hopes to eventually implement interventions and programs that serve victims in ways that are culturally and socially relevant to them. Read more about Dr. Ogbonnaya’s research. San Diego State University intercultural communications professor Yea-Wen Chen studies how people communicate about sensitive issues like politics or healthcare. Her research considers how communication affects communities and people groups, and how the ways we communicate about different cultures inevitably influences diversity, inclusion and social justice. Read more about Dr. Chen's research. Read more the KPBS story. Read more about Dr. Flores-Rentería’s research. Most people know the importance of engaging in self-care, but many of us nevertheless neglect our emotional and physical well-being. Counseling and school psychology professor Arianne Miller’s research aims to identify and remove the obstacles that prevent people and communities from participating in the vital practices that promote health and well-being. “My research looks at what people think and feel about how they take care of themselves, so we can better help them in self-care,” said Miller, whose became interested in self-care after a brain cancer diagnosis years ago. Read more about Dr. Miller's research. Former National Science Foundation director Rita Colwell praised San Diego State University during a recent campus visit as a beacon of diversity and a model for U.S. higher education. Colwell, the first female leader of the NSF and a member of the National Academy of Science, visited campus in fall 2018 to emphasize the importance of diversity in science. 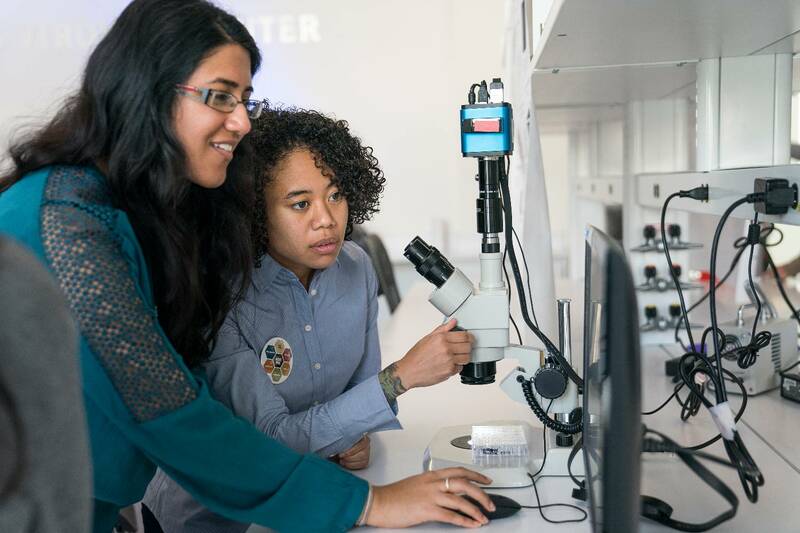 She met with faculty, students and university administrators—including President Adela de la Torre—to discuss the importance of diversity in STEM education, and attended research presentations by graduate students and visited faculty labs. Read more about Rita Colwell's visit. chemistry professor Erica Forsberg is attempting to answer this question by analyzing how the bacteria in our guts communicate with our brains. Her “gut reaction” lab studies how the beneficial bacteria in our guts produce compounds that alter how we feel and how our brains function. She plans to expand this research by looking at how diets, drugs or disease alter how gut bacteria affect neurological health. Read more about Dr. Forsberg's work. The Digital Humanities Center at the SDSU library is an interdisciplinary hub for the campus Digital Humanities Initiative and "Digital Humanities and Global Diversity" Area of Excellence. The center supports research, teaching, and learning that values the importance of the humanities, and the interactions of humans in real time and space, in the digital age. Learn more about the Digital Humanities Center. “I love research. I have an innate curiosity when it comes to asking the reasons why," says Hannah Liddle, a biology major. Liddle is one of nearly 70 students participating in SDSU’s Summer Undergraduate Research Program. Each participant works under the direction of a faculty mentor for nearly eight weeks and is funded by SDSU. The projects encompass a broad range of research and creative activities, from science to education to the arts. Read more about summer student research. Historically, fisheries and the conservation community have struggled to find common ground. The tension between one side's desire to increase profits and the other’s to preserve endangered or protected marine species that can be killed as bycatch has made it difficult to find solutions that satisfy both. Now, a new online tool developed by researchers at San Diego State University in collaboration with the National Oceanic and Atmospheric Administration and other universities could win support from both groups. EcoCast provides computer-generated maps to help fishermen target productive fishing spots while alerting them to areas likely to harbor protected species. Read more about the research collaboration. If humans are ever to colonize the moon or Mars, they’re going to need habitats, tools and other physical resources to keep them alive. Researchers are tinkering with ways to fabricate tools and building supplies from the raw minerals available on extraterrestrial terrain. Randall German, professor emeritus at SDSU, is considering how space pioneers might accomplish material engineering in space using sintering, a manufacturing process that turns a powdered substance into a solid mass using heat and pressure. To get a better understanding of how gravitational conditions in space affect the sintering process, German sent materials into space in a collaboration with SpaceX. Read more about sintering in space. MRI machines are among the most critical tools for scientists who analyze brain images to understand basic human cognition as well as disease and disorders like fetal alcohol syndrome, autism and traumatic brain injury. With the acquisition of a new machine, SDSU students and faculty are able to do groundbreaking research with brain imaging right here on the Mesa. Learn more about the MRI machine. The waxing and waning phases of the moon arise from the three-dimensional interplay between the positions of the sun, moon and Earth. It can be a complex concept for students to get their heads around—but it might become easier thanks to virtual reality programs that allow learners to watch these moon phases play out from a sort of interstellar birds-eye view. Read more about virtual reality at SDSU. More than 15 percent of Student Research Symposium participants receive financial aid from SDSU, and that’s no coincidence. Scholarship support alleviates some of the financial burden for students and gives them time to participate in activities that build leadership, research and public service skills. "I didn't really know what I wanted to do for a long time before I got into research. In joining a lab I found my path, I found out that I wanted to go to graduate school. It really set me up for my career for the rest of my life," says Greg Dawson, a biochemistry major. Read more about the strong link between financial support and student research success.